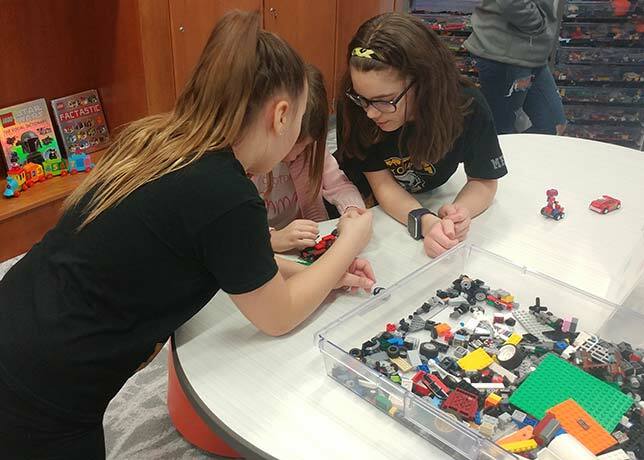 Montour Elementary students collaborate on designing and building cars, which they will then race down a custom track built by Montour High School students. 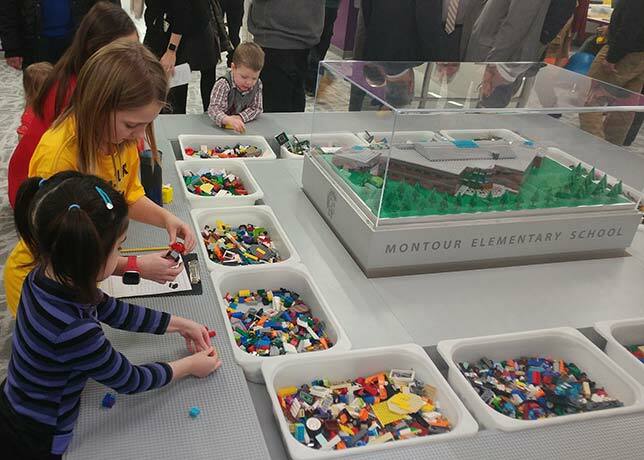 That's just one set of hands-on activities in Montour Elementary's new Brick Makerspace, which formally opened Feb. 22. Pennsylvania's Montour Elementary School stands out even among schools that have embraced STEAM education, the maker movement, hands-on learning and augmented and virtual reality. So when the K–4 school opened the world's first "Brick Makerspace" — a Lego Education-powered STEAM lab developed and implemented in conjunction with Carnegie Mellon University, Lego Education, parents, students and a local Barnes and Noble — it wasn't just a one-off affair; rather, it was yet another advance in the school's efforts to integrate principles of STEAM education throughout the curriculum. 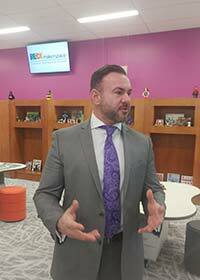 "I believe makerspaces and STEAM education get students interested in learning at a very young age," Jason Burik, co-principal at Montour Elementary, told THE Journal. "STEAM education challenges students to learn and apply content and skills with fun, real-life projects. Skills learned can later then be applied to almost any job. We wanted to create a unique learning space that kids would love coming to, something that no one else had, a room that would inspire students to become architects, engineers, designers, makers, and use problem-solving and critical thinking skills. We wanted a room that made students curious to learn and discover amazing things along the way." 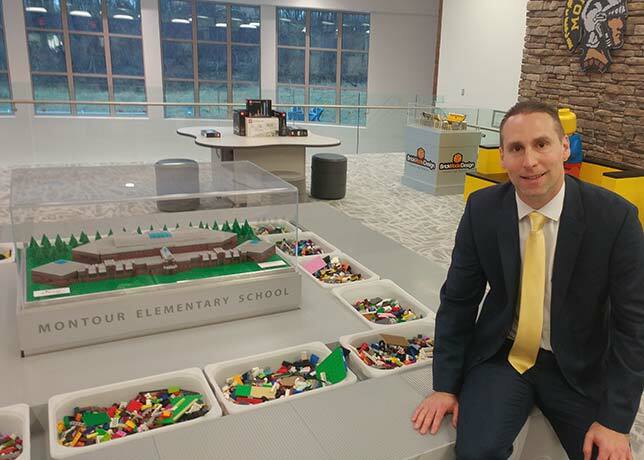 Montour Elementary Co-Principal Jason Burik is also an accomplished Lego artist. He's pictured here at the Brick Makerspace's central feature: the Creation Station. The space, which formally opened with a ribbon-cutting ceremony held Feb. 22, is themed on Lego bricks, with activities ranging from brick building to 3D printing to car racing to stop-motion animation to an interactive mixed reality system that lets students build structures and test their physical properties. Lego Education's WeDo 2.0, Lego MINDSTORMS Education EV3 and Lego Education Simple and Powered Machines are some of the tools employed in the space, along with the new Lego Education Maker activities. "The centerpiece of the room is the Creation Station, my personal favorite," said Burik, who is, not coincidentally, an accomplished Lego artist and head of Brick Model Design. A lifelong Lego enthusiast, he has in his adult life created Lego sculptures for Google, Cisco, the NFL, MLB, NHL and many other organizations. "I love to see the students stand around the perimeter of this, collaborate on projects. I've seen some really neat lessons take place here, in science and math. One, for example, is similar to a paper pass in the classroom. Kids start with a base plate, and they add one block. They have to pass to the person to the right, keep adding to that block. And when it comes back to them, it's a really neat creation. And they have to give it a title, count how many blocks are in it, what colors were used in it, what its purpose is. There's all kinds of things you can do with that. It's a simple activity." Students work on a project at the Creation Station. With good cause, the school, located just outside of Pittsburgh in Robinson Township, is proud of its accomplishments in STEM and STEAM education and the collaborative efforts of its leaders with parents, students, industry and higher education. The almost brand new school (opened last year) was purpose-built for STEM and STEAM education. Prior to the Brick Makerspace, the school had already built, in its comparatively short history, a Minecraft Education Lab (in partnership with Microsoft Education), a Google Lab, a STEAM Lab and an Upcycling Room (where used objects are "upcycled" to produce new creations, often as part of art lessons), and it offers various STEAM electives and activities available to students from kindergarten through senior year (in the high school that sits next door). In addition, the school is nearly finished constructing its own MIT Fab Lab, which is expected to open within a month or two. All this in a public K–4 elementary school. But it isn't just about the technology or the spaces themselves. It's about learning and providing students with opportunities for growth that are beyond the ordinary yet align with education standards. Justin Aglio, director of academic achievement (K-4) and district innovation at Montour School District. "Our goal is to take the creativity and curiosity and actually build something and incorporate engineering concepts, architecture concepts, animation, storytelling, testing, prototyping. 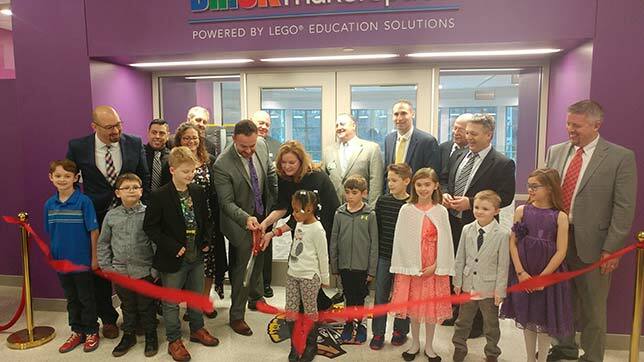 We're trying to take this whole Brick Makerspace with Lego and say how can we bring this not just to a special space but incorporate it, embed it within everything we do within the curriculum," said Justin Aglio, director of academic achievement (K-4) and district innovation at Montour School District. The aim of the space is to provide hands-on learning experiences for the school's young students to foster "spatial, fine motor, social, language and creative skills," according to Lego — all that across a range of disciplines, including science, technology, engineering, math, arts, language arts and architecture. 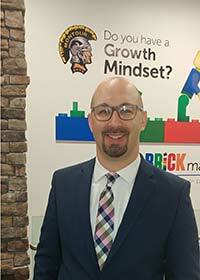 "Supporting Montour Elementary School's new Brick Makerspace with our Lego Education solutions is a natural collaboration as we share the same priorities of student-centered learning and the dedication to sparking and engaging the innate curiosity of every student with hands-on playful learning tools," said Silver McDonald, head of Lego Education North America. "We look forward to seeing what the students using the new space will imagine, build and create for years to come, and how the 21st Century Skills they are acquiring will inspire and equip them for their future careers." "One of the things we've done over the past couple years, specifically here at Montour [Elementary], is really tried to create spaces for kids to show their love of creativity and ingenuity," said Christopher Stone, superintendent of Montour School District. "I think this space epitomizes that. Without a lot of direction, kids have the opportunity to come in here and really be creative and share their level of creativity with the teachers and have the open discourse and discussion. There's a lot of carryover to 21st century soft skills — being creative, communicating with their peers, presenting. This is a space that certainly does embrace that idea." Montour teachers, administrators and students at the Feb. 22 ribbon-cutting ceremony for the new Brick Makerspace powered by Lego Education. Christopher Stone, Montour School District superintendent, and Silver McDonald, head of Lego Education North America, hold the scissors. Those teachers are extremely enthusiastic about the hands-on learning spaces in their school, and in particular the new Lego space. And they told THE Journal their students are wildly enthusiastic about the Lego space as well. "When I tell my students we're going to the LEGO room, their eyes light up; they're jumping out of their seats. When we come up here, their eyes are as wide as anything; they're just super excited to be here," said Karen Bell, a kindergarten teacher at Montour who's been teaching various grades for 18 years. "From a creative standpoint, the kids really enjoy having the opportunity to take what they're learning and put it into something that they're touching and feeling and to be creative," said Linda Ewonce, fourth-grade teacher now in her 12th year as an educator. "In the classroom there's a certain amount of instruction you have to provide, but there's also experiences you can provide for them in these rooms that we didn't have before. We always used math manipulatives and things that they could touch and feel, but in here we can bring them in and give them a challenge and let them run with it rather than telling them how to use the manipulatives. And they will all find a different way to do it." 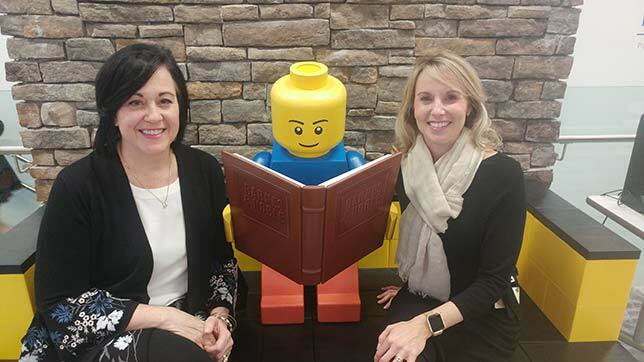 Montour elementary educators Karen Bell (right) and Linda Ewonce seated at "the most-photographed spot in the school," a bench made of blocks built by students and featuring a not-so-mini Lego figure. (The figure was donated by a local Barnes and Noble store.). As an example, she said she recently assigned students a project for a science unit that involved building houses to put electrical circuits in. "And I think two of them built houses. The rest of them built things like cars; we had a movie theater; we had a garden with an amusement park out back. Just allowing them to be creative with it." Students also take items from the makerspace to work in the classroom, which allows them to finish projects beyond the time allocated to the class in the makerspace. Ewonce said her class is using the Brick Makerspace on average about once a week, though it had been everyday in the weeks leading up to the formal opening. Whatever time they spend there is well used, she explained, whether it's developing competencies that are part of formal standards or developing softer 21st century skills. "It's very open-ended and allows them to think on their own," she said. "And there's other things that come out of it too, like they have to communicate with each other — which is a skill they're really trying to work on — analyzing things together and then just basic math skills — shapes, colors, sorting." The Brick Makerspace isn't just about snapping Legos together. There's also some unusual STEM- and STEAM-related digital technologies involved. 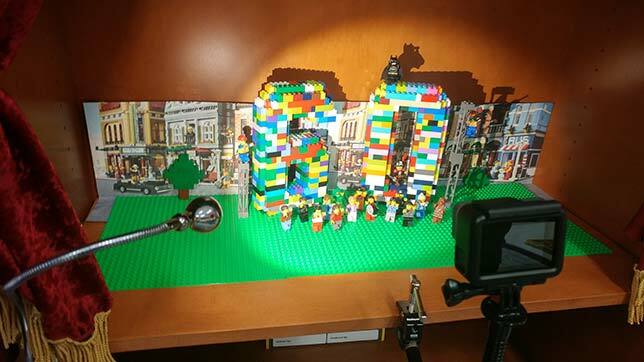 Two groups at Carnegie Mellon University contributed two of the stations in the Brick Makerspace. One is a system called NoRILLA (Novel Research-based Intelligent Lifelong Learning Apparatus), which uses mixed reality technologies and artificial intelligence to allow students to experiment with physical properties. Essentially, students are given a task that involves constructing a structure (out of Lego Duplo blocks), then see how long their structures can stand when the platform moves. Students experiment with structures using "EarthShake," a game that's part of the NoRILLA system. CMU researcher Nesra Yannier also appears in the video with the students. According to Nesra Yannier, a researcher at the Human-Computer Interaction Institute at Carnegie Mellon University and founder of NoRILLA, the mixed reality and interactive guidance provided by the system's AI have been shown to improve learning by a factor of 5 when looking at pre-tests and post-tests. "We did a lot of research where tests showed that having the mixed reality system and having the interactive guidance provided by the virtual on top of the physical, hands-on experience improves kids learning by five times compared with tablet or computer games, as well as improving their enjoyment," Yannier said. "So they enjoyed it more when they did it in the real world with interactive feedback, and they also learned much more [about physical principles between] pre- and post-test. We also saw that if you just let them play with physical materials like in most makerspaces, they don't learn as much unless they have the interactive guidance on top of it." The interactive guidance also helps teachers, especially those without science backgrounds. Teachers said the interactive system helps them with their teaching. "So our goal is not to replace the teacher but to aid them in the class. We create a lot of lesson plans for teachers to be able to use it in the classroom easily." Yannier's colleagues Ken Koedinger and Scott Hudson, who were not present at the makerspace opening, were also involved with the development of the system. 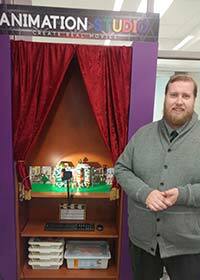 Another CMU group, the Entertainment Technology Center, set up a station in the Brick Makerspace called the Animation Studio, where students can build sets and props out of Legos and create stop-motion animations with the use of a GoPro. Lessons are mapped to ISTE standards and cover a wide range of disciplines, as CMU's John Balash explained: "In helping design the prototype for the Animation Studio, we wanted to be able to mirror some of the vision of the Entertainment Technology Center at Carnegie Mellon University," he told us. "One of the co-founders of our department was Randy Pausch — known for The Last Lecture, but also known for head fakes — the learning objectives that aren't necessarily visible right away. In the Animation Studio and what you're making, you're learning all the techniques with the cameras and the cuts and the angles, but in the same way you're learning about narrative; you can learn about social and emotional learning and also how to work as a team. So those are the less visible but equally — if not more — important values." At least as far as the school and district budgets were concerned, the Brick Makerspace (aside from the facility itself, which was part of the original construction) was just about free. Bricks were donated by parents. A literature library and props were donated by a local Barnes and Noble. Students built parts of the space. And grants provided the tools and technologies involved in the NoRILLA and Animation Studio from Carnegie Mellon. A promotional video created by the school showing off some of the features of the new Brick Makerspace. Montour's case may be stand-out, but the school is one part of what appears to be a large and growing movement in the Pittsburgh area to advance STEM and STEAM education, hands-on learning and the maker movement. According to Gregg Behr, Remake Learning council member and executive director of The Grable Foundation, there are now more than 180 documented makerspaces in and around the immediate are of Pittsburgh. (A partial map of those can be found here.) There are also 19 professional development programs in the area "supporting educators as they integrate maker mindsets in their instructional practices," Behr explained. "Over the past decade, more than 500 schools, museums, libraries, early learning centers, after school organizations, ed tech companies and institutions of higher education have banded together to advance relevant, engaging and equitable learning opportunities for our children," he said in his opening remarks are the ribbon-cutting ceremony last week. "In STEM classrooms, in STEAM labs, creative corners of libraries, educators are remaking learning in and out of school, pre-K through higher education and beyond." "We work with a lot of districts all across the country, and a lot of people are figuring out how to make makerspaces wok for them," Lego's McDonald added. "What I love that the district did here is they really involved the parents and community.... I think the collaboration that they've done with the community leaders as well has also helped to scale what they're able to offer, and this is definitely a best-in-class offering."